James L. Bond of Plymouth, and former longtime resident of Needham, March 26, 2019, at the age of 85. Husband of Evelyn Whitaker Bond and the late Helen M. Bond. Father of Steven J. Bond of Bolton and Susan M. Bond of Framingham. Grandfather of Robert Bond, Abigail Bond and Daniel Camargo. Born and raised in Adrian Michigan, he attended Adrian schools, Stanton Military Academy and was a graduate of the University of Michigan, class of 1959. He was a member of the ATO Fraternity and also served in the U.S. Army in Austria. He was Past Master and a 50-year member of Norfolk Lodge AF & AM in Needham, Past Patron of Wistaria Chapter, Order of the Eastern Star, in Needham, and Past Patron of Pequoisette Chapter in Watertown. 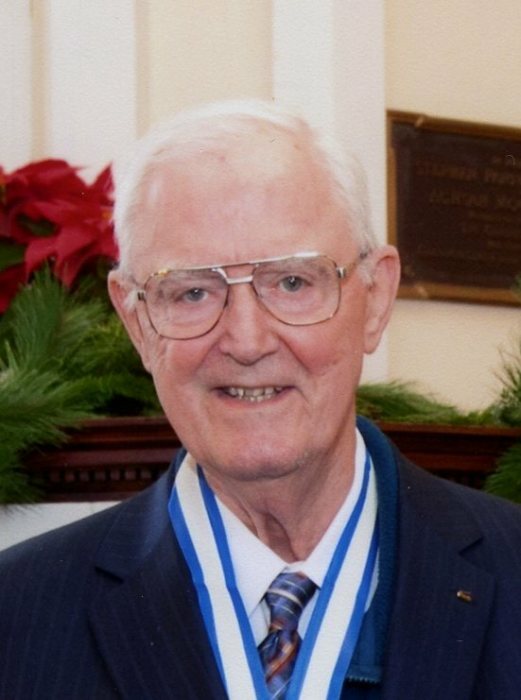 He was a Greater Boston Council Commissioner and recipient of the Silver Beaver Award for many years of service as an Adult Volunteer Leader for the Boy Scouts of America. Visiting hours will be held in the Eaton Funeral Home, 1351 Highland Ave, ighland Ave, Needham HNeedham, on Sunday, March 31st from 3-6 pm with a Masonic Service at 5:45PM. A funeral service will be in the Eaton Funeral Home on Monday April 1st at 11 am, followed by burial at The Gardens Cemetery in West Roxbury.